Got this picture from Sri. Arvind Venkatraman. 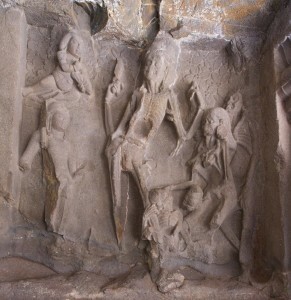 The image is from the twenty first cave of Ellora. Here my Father is depicted with his ferocious form. He stands in Ati bhaṅga position and has four hands. He has Jaṭāmakuṭa and ferocious look. He smiles with his tusks. His ears are decorated with karṇakuṇḍala and Patra kuṇḍalas. Starting with his neck, only skeleton is shown. His upper hands have a Churikā and a pigeon like bird. His lower hands are damaged. He has leather made Kaṭi-bandha followed with a kaupīna. The portion above the genital organ is projected and can be confirmed that the figure is a male. His legs are also damaged and the left is hold by a Piśāca (ghost). There are two Piśācas shown in the left and a godly man along with a flying pramatha gaṇa are depicted at the right. 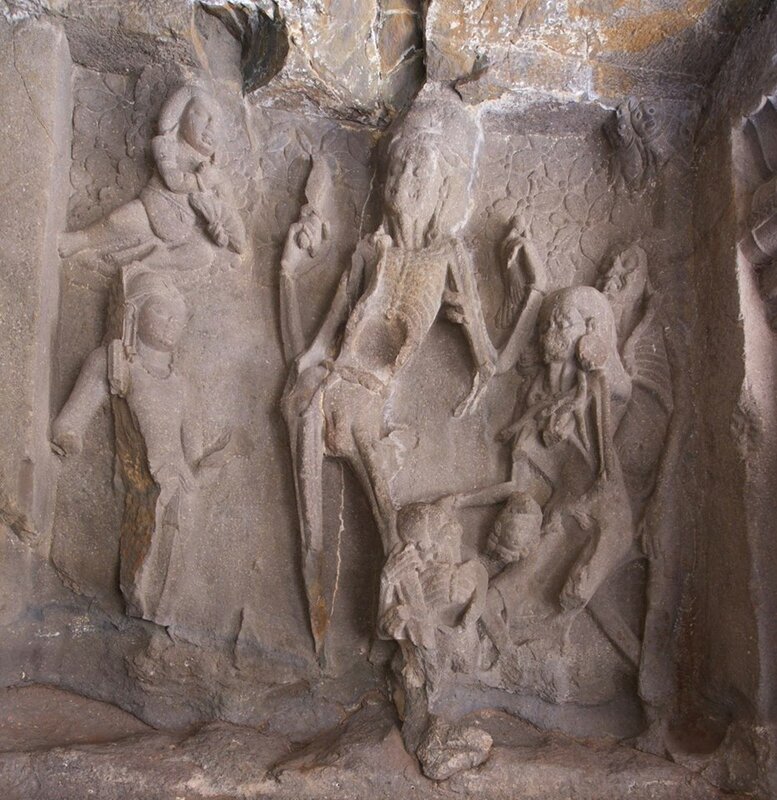 Two owls are shown in the right top to depict the scene is from śmaśāna (graveyard). Kinnara śiva will be in śmaśāna and will be in Mauna vrata. He will be surrounded with so many Piśācas. He will have matted hair (Jaṭā) and will wear Kaupīna. His body will be painted with the holy ashes. He will hold a lion, the symbol of the tuber closes on the edge of the śūla and will fry the same in the fire. Such Kinnara śiva may remove our sin. Almost all the prescriptions are met in this figure except the śūla with lion and the back hand possessions. Since the front hands are damaged we can make an assumption that there may be śūla in the hand and the back hands can be traced from some other texts. Some scholars identified this figure as Cāmuṇḍi since it placed next to Saptamātṛ panel. But certainly this is not a female figure. The reason is explained above. Hence this figure can be identified as Kinnara śiva and we shall pray to this form my Father to get rid of sins. Iconography Ellora, Kinnara Siva. permalink. I was fortunate to attend your session that you provided at Thakkar baba school, Venkatnarayana Road, T.Nagar. It was quite informative and interesting. Thanks a lot.